The parka is a true wardrobe staple, but what exactly defines the parka, what are its origins and what makes the parka-style coat such a popular winter option? The word “parka” supposedly comes from Nenets, a language of the Samoyedic people of the Ural Mountains in the northern part of modern Russia. Some speculate though that the term is derived from the Aleut people and thus took shape via the Russian language instead — the word in Russian simply translates to “animal skin“. The amauti is the parka worn by Inuit women of the eastern Canadian arctic. Up until about two years of age, the child nestles against the mother’s back in the amaut, the built-in baby pouch just below the hood. The pouch is large and comfortable for the baby. The mother can bring the child from back to front for breast-feeding or for eliminatory functions without exposure to the elements.This traditional eastern Arctic Inuit parka, designed to keep the child warm and safe from frostbite, wind and cold, also helps to develop bonding between mother and child. The Fishtail Parka was first used by the United States Army in 1950 during the Korean War. Following the end of the Second World War the US army recognized the need for a new cold weather combat system, resulting in four main styles of fishtail parka: the EX-48, M-48, M-51 and the M-65. The “M” stands for “military”, and the number is the year it was standardized. The EX-48 model was the first prototype or “experimental” precursor to all of them. The M-48 then being the first actual production model fishtail parka after the pattern being standardized on December 24, 1948. The name fishtail comes from the fish tail extension at the back that could be folded up between the legs, much like a „ Knochensack” and fixed using snap connectors to add wind-proofing. The fishtail was fixed at the front for warmth or folded away at the back to improve freedom of movement when needed. The next revision was the M-51, made because the M48 was so good and of such high quality it was just too expensive to mass-produce. The outer hood of the M-51 Fishtail Parka is integral to the parka shell, an added hood liner as well as a button in main liner make the M-51 a versatile 3 piece parka. The idea behind this 3 part system was to enable a more customisable parka that allowed for easier cleaning of the shell as the hood fur was on the detachable hood liner, not fixed to the shell as in the M-48. It was also cheaper than the M-48 to mass-produce the early M-51 was made of heavy sateen cotton, the same material as the M-48. The M-65 fishtail parka has a detachable hood and was the last revision. It features a removable quilted liner made of light nylon / polyester batting which are modern synthetic materials. The M-65 fishtail parka first came into production in 1968. These parkas featured synthetic fur on the hoods after an outcry from the fur lobby. As a result, only hoods for these parkas made in 1972 and for one year later have real fur. Designed primarily for combat arms forces such as infantry, they are to be worn over other layers of clothing; alone, the fishtail parka is insufficient to protect against “dry cold” conditions (i.e. below about -10 °C). As such all fishtail parkas are big as they were designed to be worn over battle dress and other layers. In the 1960s UK, the fishtail parka became a symbol of the mod subculture. Because of their practicality, cheapness and availability from army surplus shops, the parka was seen as the ideal garment for fending off the elements and protecting smarter clothes underneath from grease and dirt when on the mod’s vehicle of choice, the scooter. Each Parka is individually bespoken with the client (pre-owner of the mink fur coat, supposed as lining for the M78 Parka). Accordingly each M78 is handcrafted and finally each custom-made Parka is unique. Each Parka outer shell is recycled & created rom original army tents. As lining of each M78 Parka we only do use real (vintage) fur – upcycled from pre-existing high quality mink & wild sable fur coats. The M78 Parka has a fixed oversized hood – it’s a perfect protector for cold, windy & rainy days. The shape & size is assumed from the Original M65 (detachable) parka hood. Extra Feature: Each M78 Parka hood is completely fur lined (mostly up cycled form the sleeves of vintage fur coat). It would be sad if vintage coats and jackets remain unworn in closets or in the family fundus – beyond that “oldtimer fur” is less toxic to the environment than faux furs, which are made from petroleum. In our world of overflowing landfills and global warming, recycling is more relevant than ever. Fur is natural, recyclable and is one of the few clothing materials that can be re-styled several times, worn for generations and many seasons. 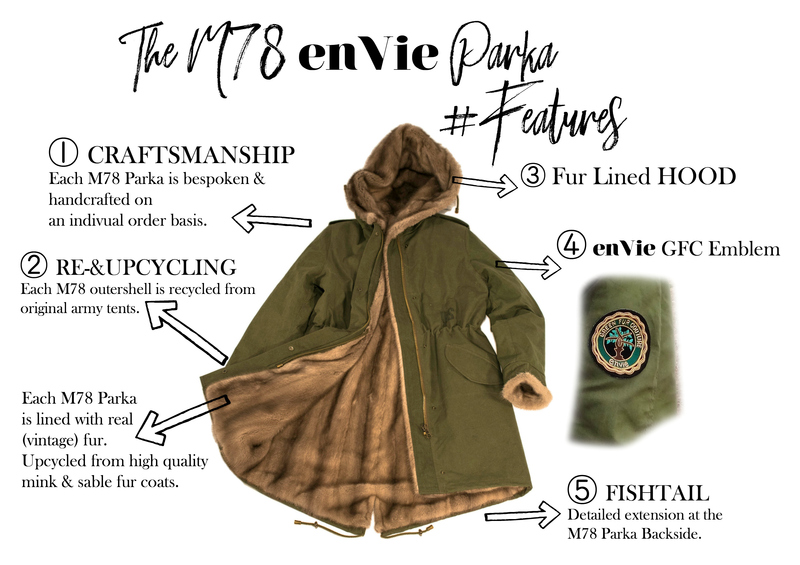 Each M78 Parka lined with vintage fur has an enVie Green Fur Couture signature emblem on the sleeve or below the hood. The name fishtail comes from the “fish tail” extension at the backside of the Parka. The fishtail was fixed at the front for warmth or folded away at the back to improve freedom of movement when needed. We kept the fishtail as important parka feature & moreover it’s a modern fashion detail.